Operation Cobra was the codename for an offensive launched by the First United States Army eight weeks after the D-Day landings, during the Normandy Campaign of World War II. American Lieutenant General Omar Bradley's intention was to take advantage of the German preoccupation with British and Canadian activity around the town of Caen, and punch through the German defenses penning in his troops while his opponent was distracted and unbalanced. Once a corridor had been created, the First Army would then be able to advance into Brittany, rolling up the German flanks and freeing itself of the constraints imposed by operating in the Norman bocage countryside. After a slow start the offensive gathered momentum, and German resistance collapsed as scattered remnants of broken units fought to escape to the Seine. Lacking the resources to cope with the situation, the German response was ineffectual, and the entire Normandy front soon collapsed. 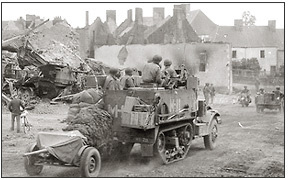 Operation Cobra, together with concurrent offensives by the Second British and First Canadian Armies, was decisive in securing an Allied victory in the Normandy Campaign. Having been delayed several times by poor weather, Operation Cobra commenced on 25 July with a concentrated aerial bombardment from thousands of Allied aircraft. Supporting offensives launched by the British and Canadians had drawn the bulk of German armored reserves away from the American sector, and coupled with the general lack of men and materiel available to the Germans, it was impossible for them to form successive lines of defense. Units of VII Corps led the initial two-division assault while other First Army corps mounted supporting attacks designed to pin German units in place. Progress was slow on the first day, but opposition started to crumble once the thin defensive crust had been broken. 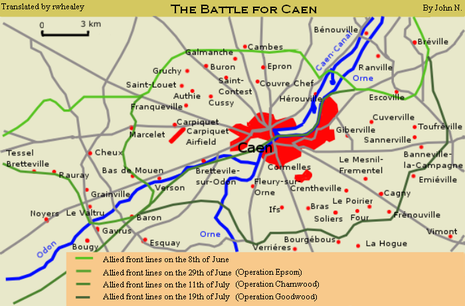 By 27 July most organized resistance had been overcome, and VII and VIII Corps were advancing rapidly, isolating the Cotentin peninsula. By 31 July, XIX Corps had destroyed the last forces opposing the First Army, and Bradley's troops were finally freed from the bocage. Reinforcements were moved west by Marshal Günther von Kluge and employed in various counterattacks, the largest of which (codenamed Operation Lüttich) was launched on 7 August between Mortain and Avranches. Although this led to the bloodiest phase of the battle, it was mounted by already exhausted and understrength units and had little effect other than to further deplete von Kluge's forces. On 8 August, troops of the newly activated Third United States Army captured the city of Le Mans, formerly the German Seventh Army's headquarters. Operation Cobra transformed the high-intensity infantry combat of Normandy into rapid maneuver warfare, and led to the creation of the Falaise pocket and the loss of the German position in northwestern France. Six weeks after the Normandy landings, the British Second Army still struggled to take Caen and the U.S. First Army was mired in the Cotentin Peninsula’s dense hedgerow country. 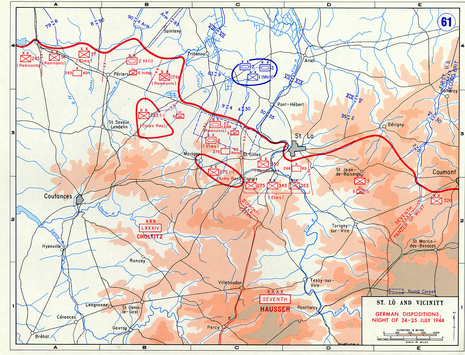 The American seizure of St. Lô on July 18, 1944, set the stage for Operation Cobra, which kicked off the breakthrough of the German lines on July 25.